The Siamese crocodile is a freshwater crocodile that was thought to be extinct in the wild until conservationists found a nest of baby Siamese crocodiles in the southern Lao province of Savannakhet in March of 2005. Today the only remaining large wild populations are found in the Mekong River basin and wetlands in Cambodia. Males can reach as long as 13 feet, but most individuals do not exceed 9.84 feet. This crocodile is very different from other crocodile species, as they are very brightly colored with many patterns like that of juvenile crocodiles. The patterns of other young crocodiles species normally disappear with age, but these brightly colored patterns are quite typical in adults, although they are less pronounced. They are also relatively inoffensive compared to other crocodile species and are a low threat to humans. In the wild, Siamese crocodiles prefer slow moving waters with swamps, rivers, and some lakes. Diet consists mainly of fish, but they will also eat snakes, insects, frogs, and possibly small mammals. In captivity, they are fed chickens with the feathers removed. This species is known to breed in the wet season, which occurs in April and May. Females lay from 20 to 50 eggs in a mound nest, and guards and defends the nest until they hatch. She is even known to "roar" when approached by other adult crocodiles. The eggs hatch after 80 days, and the female then carries the young to the water. Today, only 200 Siamese crocodiles exist in the wild due to habitat destruction and hunting. The skin of the Siamese crocodile is one of the most valuable reptile hides since it has small to medium size scales with no osteoderms or bony bumps. The remaining natural habitat of this species is being preserved, and they are bred extensively in captivity to be later introduced into the Bang Sida National Park in Thailand (a protected area). 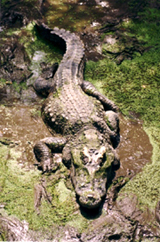 Several thousand Siamese crocodiles are found in zoos and on farms, although many are hybrids often with the Saltwater crocodile (Crocodylus porosus). Copyright Notice: This article is licensed under the GNU Free Documentation License. It uses material from the Wikipedia article "Siamese crocodile". Glenn, C. R. 2006. "Earth's Endangered Creatures - Siamese Crocodile Facts" (Online). Accessed 4/21/2019 at http://earthsendangered.com/profile.asp?sp=96&ID=3. Need more Siamese Crocodile facts?